Give yourself a bit of retail therapy at Art Gallery of Ballarat and Melbourne Central. Shrine of Remembrance and Bruno's Art and Sculpture Garden will appeal to museum buffs. 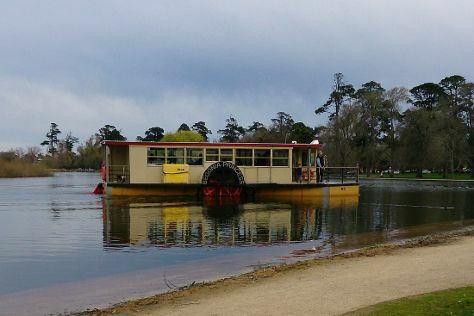 Explore the numerous day-trip ideas around Melbourne: Daylesford (The Mill Markets & Lake Daylesford), Ballarat (Lake Wendouree & Ballarat Wildlife Park) and Yarra Valley Chocolaterie & Ice Creamery (in Yarra Glen). There's still lots to do: kick back and relax at Eastern Beach Reserve, contemplate the long history of St. Patrick's Cathedral, admire the masterpieces at Victorian Artists' Society, and explore the galleries of Blender Studios. For reviews, photos, traveler tips, and more tourist information, read our Melbourne trip itinerary planning website . April in Melbourne sees daily highs of 23°C and lows of 11°C at night. Finish your sightseeing early on the 16th (Tue) so you can travel back home.